Posted on November 22, 2014 by staceyanderton1	in News and tagged Engineering, Penn State Behrend. Saegertown High School ladies ventured to Penn State Behrend today to participate in the ninth annual Women in Engineering Day. Sixteen girls in grades ten and eleven attended the day of math and science related activities along with many other schools in Pennsylvania and southern parts of New York. Guest speaker and PSB alumni, Tiffany Beers from Nike talked to the students about the opportunities that await those with engineering backgrounds. 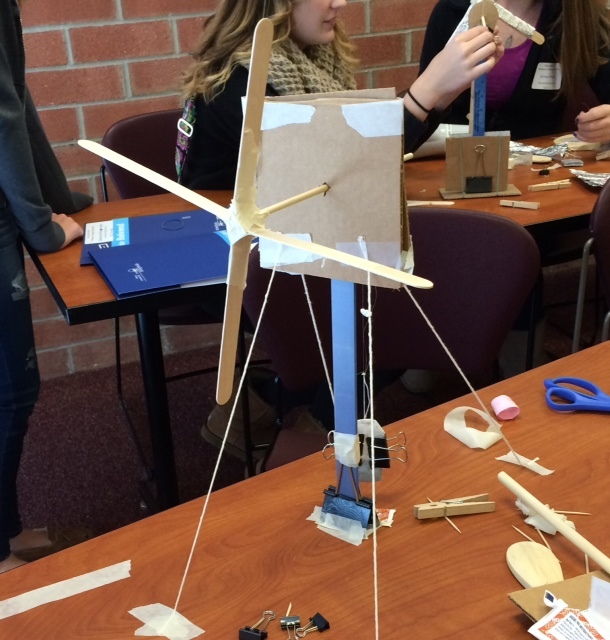 Students attended different sessions where they created things such as windmills, gumball machines, and lava lamps. Presenters came from varying companies to help with the activities: Construction Process Solutions, Ltd., Erie Insurance, Eriez Magnetics, FMC Technologies, GE Transportation, and LORD Corporation. The program is designed to help steer students into thinking about their lives after graduation. “It was very informative. I have been thinking about my future a lot recently, and I think engineering is definitely plausible for me,” said sophomore Sydney Kightlinger. Many students left the campus with thoughts of engineering possibilities. To find out more, visit the Women in Engineering Day page at Penn State Behrend.